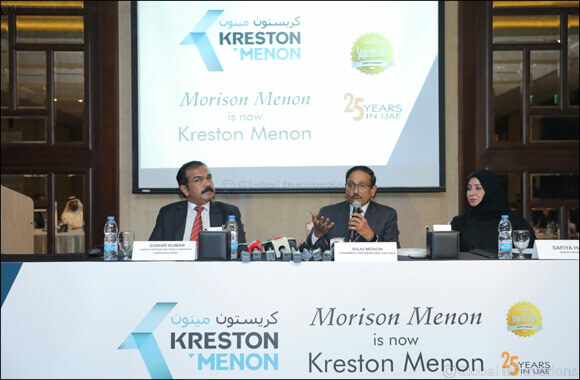 Dubai, UAE, January 07, 2019: After 25 years of professional service in the region, Morison Menon has made a strategic alignment with the 12th top global accounting network Kreston International. Announcing this progression to Kreston Menon in a press conference, Raju Menon, Chairman and Managing Partner, Kreston Menon said that with this strategic movement, the organization is all set to enhance their service range. “ At Morison Menon we have been providing professional assurance, consulting and business advisory services in the UAE and across the region for the last 25 years. Our commitment and the cherished values have enabled us to successfully expand our footprint in the UAE with 9 offices and over 300 people. We felt an inherent need to associate with one of the top global accounting network and the result is Kreston Menon. All the required governmental procedures to incorporate the name change has been completed and our trade licenses in the UAE have been amended accordingly to reflect our new name. There will be no change to our management team and each of our partners are committed to serve our clients with greater vigor and enthusiasm. The core values of Kreston are trust, responsiveness, quality, integrity and collaboration. These values align very much with our core values, which we believe will provide us with additional depth and global competence to enhance the quality of our professional services to the business community at large,” he added.